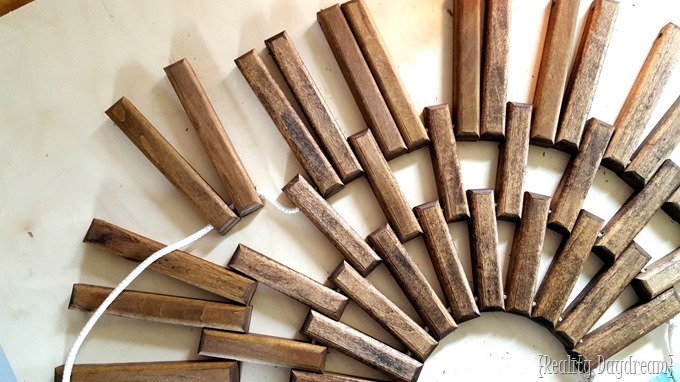 We’re honored to collaborate with EcoScraps on this post, and were compensated for our time. All opinions and project ideas belong to us! I love the idea of using Cinder Blocks as planters, and have seen some really cute ones out there. 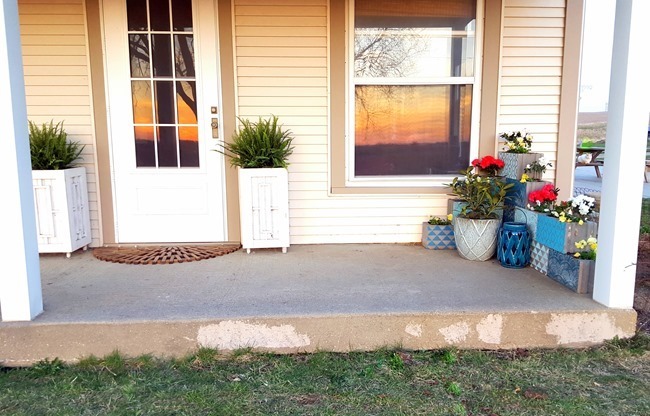 As you know I’ve been making an effort to ‘freshen up’ our front porch (that we never use, but is very visible from the road), so I thought it would be fun to add a cinder block corner planter to balance the cuteness from the Hanging Gutter Planter on the opposite side of the porch! Of course it would be out of character for me to not add my personal touch to these otherwise boring chunks of cement, so I decided to use a handful of stencils from my extensive stencil stash to add some pattern and a punch of color… very similar to the Patchwork Accent Wall I did in the twins’ room! This was a quick and easy process! But if you’re doing this outside, make sure it’s on a day when there’s absolutely no wind. This post contains affiliate links. Please see our disclosure policy for more info! I used 4 different shades of aqua / turquoise and the following stencils: Small Spanish Lace, Small Margarita Lace, Chez Ali Moroccan and Step Up Triangles. 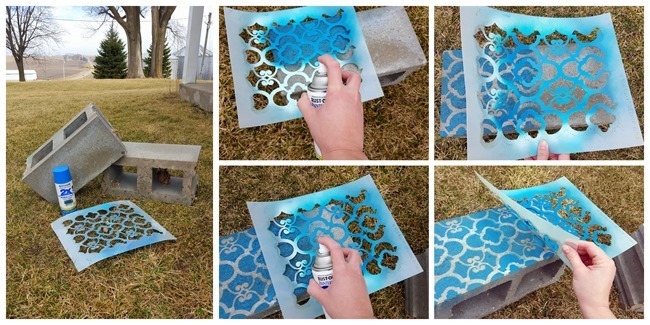 I just randomly painted each cinder block with a different stencil color combo until they were all painted. 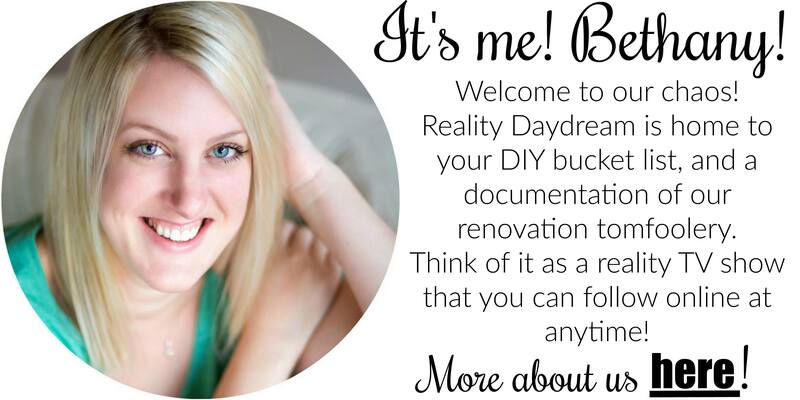 Such a fun project with instant gratification! We have the profound honor to be working with a company called EcoScraps, and love that they recycle food scraps into organic soil and plant food. 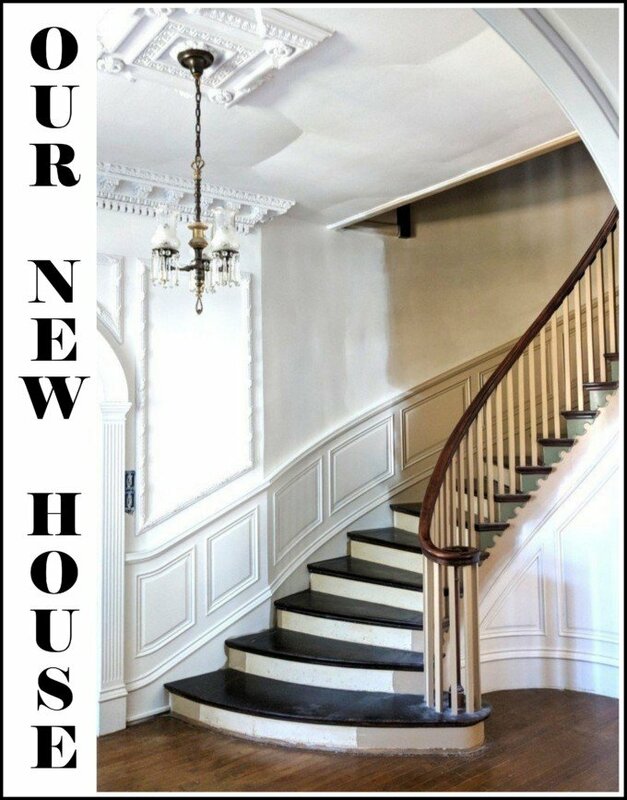 Truthfully this comes at a great time with my new resolution to ‘have a greener thumb’ and our efforts to up our curb appeal with pretties this spring. 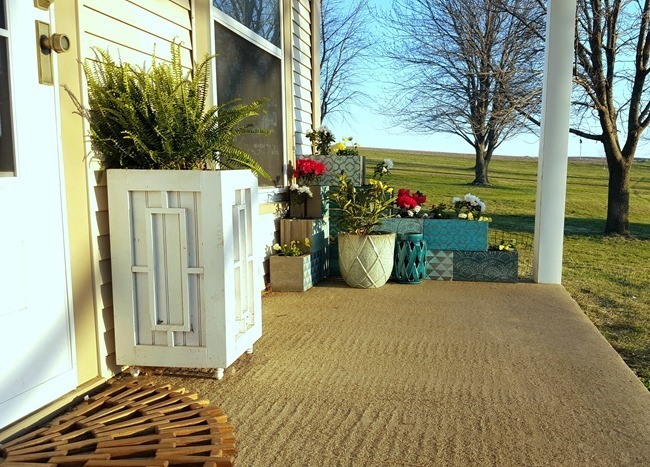 And it fits seamlessly with this DIY Cinder Block Planter project! Isn’t that a hilarious video? Doesn’t it make you inexplicably want to be a better person in all areas of your life? What could be a better business model that reusing waste to keep it out of landfills in an effort to make sustainability more mainstream?! 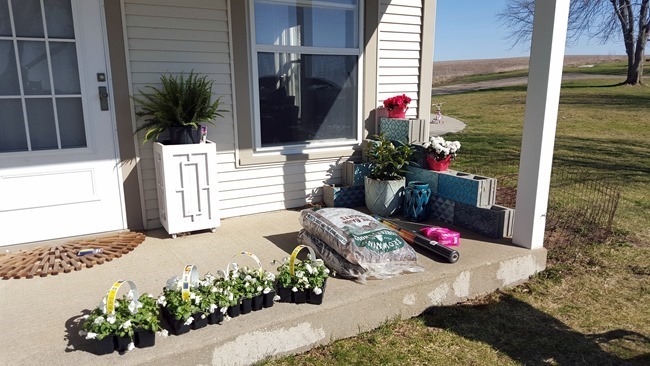 We snagged ourselves a bag from Lowes, and got our hands dirty planting Azaleas and Pansies in our Cinder Block Planter! For the taller stacked areas of cinder block, we filled them in with bark mulch up to the top cinder block with a layer of landscaping fabric on top, and then added the last 6 inches of soil and a sprinkle of EcoScraps ACR mix (which is specifically for flowers). 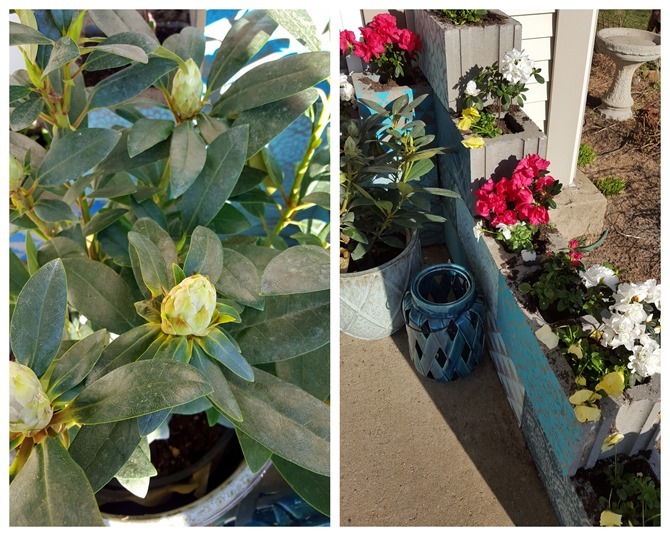 Would you look at those Rhododendron buds (pictured above)? Cannot wait for those suckers to bloom! We’ll eventually plant her on the SW corner of our house. But for now, she’s looking all pretty in a pot. Even in just the few days since taking these pictures, the grass has greened up, and the trees are filled with leaves. 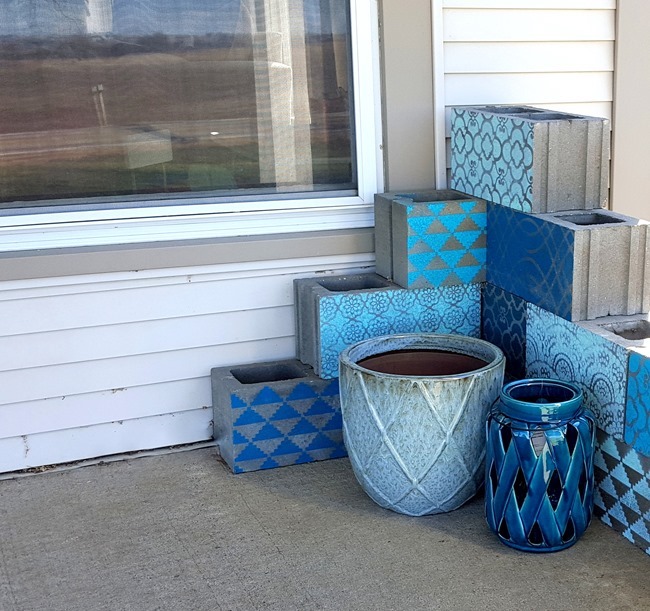 I should have waited to take my pictures of my new Cinder Block Planter! I made myself another half-circle wooden doormat and will be re-writing a tutorial for it soon! I made some changes to make it more durable, and took better photos this time. You can look forward to that! Now that I know how inexpensive cinder blocks are, my head is swimming with different ways to use them. Like have you seen these benches made only with cinder clocks and 4×4’s? So innovative! Have you been out and about playing in the dirt yet? 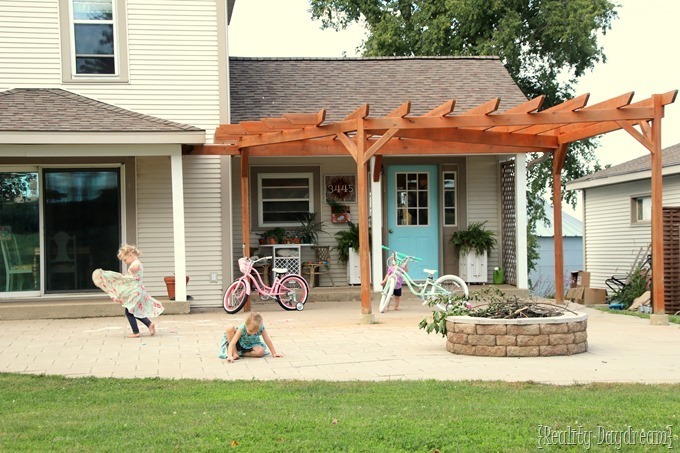 Are you like me and trying to up your landscaping efforts this year? 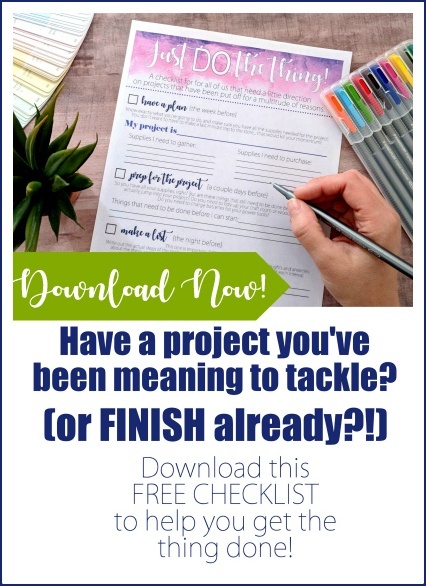 I’d love to hear about what you’re planting! 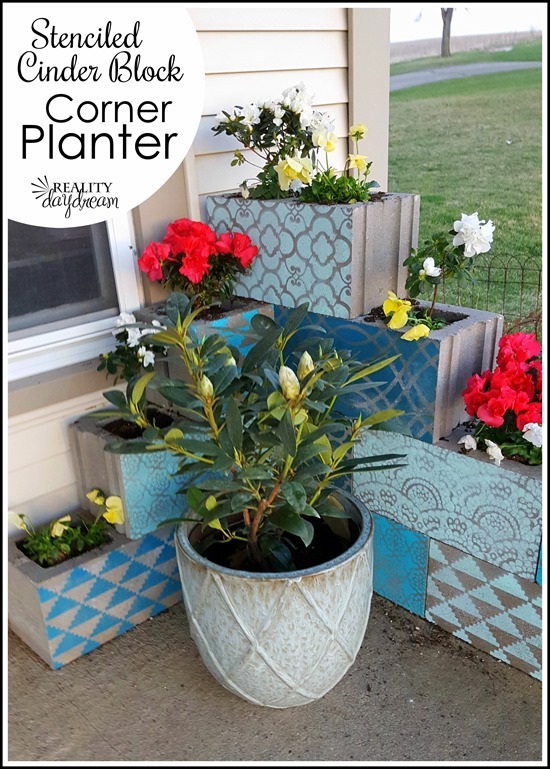 And of course please let me know if you make one of these cinder block planters! 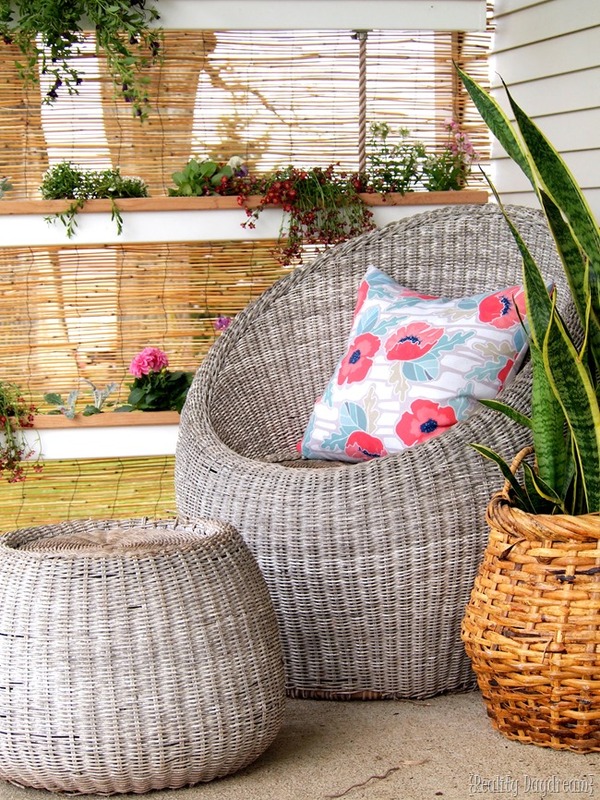 Huge thanks to EcoScraps for collaborating with us on this project. We were compensated for our time, but all opinions and project ideas are 100% ours! We’re honored to partner with a company that is taking strides to make our world a better place. Just knowing that 40% of food is wasted makes me sick… that’s enough to fill the Rose Bowl EVERY DAY. Why not recycle it to make our plants happy?! love it! Where did you get those white planters? Hi Anna! We MADE those planters! And there’s a tutorial! Hi! 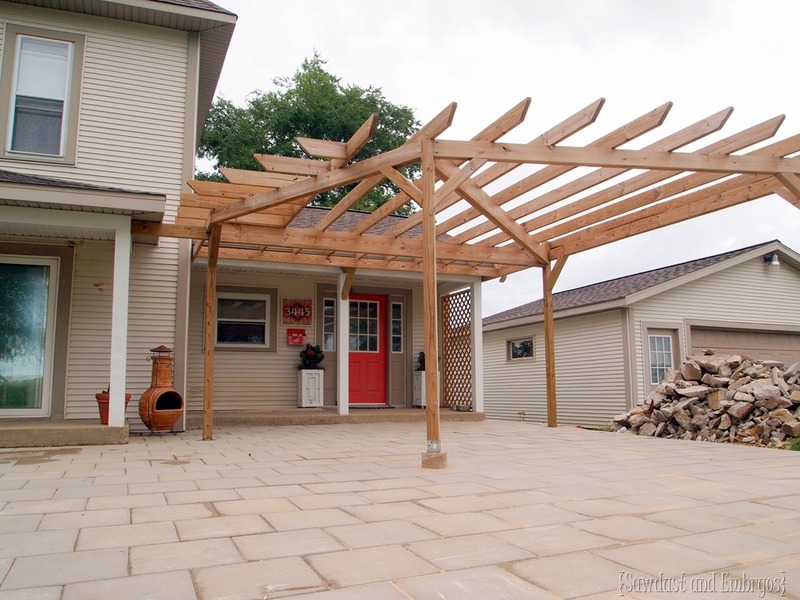 I love cinder blocks and made a smaller version of this on my patio. 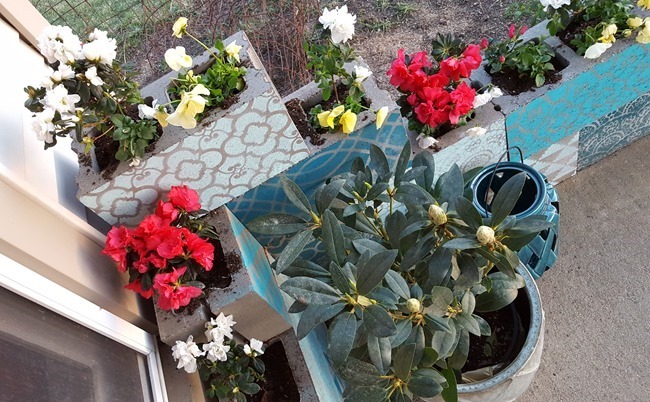 I used coffee cans with flowers planted in then to go in the cinder block holes. I am curious.. planting directly into the cinder block holes, when you water do you get mud from underneath? How do you replant each year? What do you do in winter? Thanks for the detailed tutorial. I would love to try it out the way you did them! If you have done the tutorial for the half round doormat, could I please get the link? I love so many of your ideas! Thanks! Great project! It took 4.5 hours including going to get the supplies. Nice! I would love to see pics! What a great idea and soooooo cute! Do you put anything underneath each block to keep the dirt/mulch from falling through itf they are moved? Yes we put a layer of landscape fabric under each of the top cinder blocks. It worked really well! And the weight of the cinder clock keeps it in place perfectly! What a great idea, painting the cinder blocks .. I will try this! Very clever. Also, I am so glad to see that hgtv is expanding organic gardening .. and that video is very funny and gets the message across about composting and looking for organic products!! OMG- so freakin’ amazing! I love these, great job! I’m making the bench with cinder blocks in our son’s memorial garden. I bought this deep burgundy colored paint (clearance) and am feeling it is a bit too “cement block” looking. However, this stencil idea just might gussy it up a bit to make me feel a bit better about this project. Thanks for the “fantabulous” idea! How fun! You must send pics! Beautiful Beth! Love your color choices. I have some cement stepping stones that I have wanted to paint for a long time. You have given me the desire to get started. Your Rhodi is gorgeous. What color did you get? I just got a beauty at HD that has white blooms. I’m growing a few tomatoes and herbs in “straw bales” this summer. First for me. Watch my FB page for picture updates on how that is working for me. Have a great weekend. Vikki in VA.
How fun Vikki! And my Rhododendron is a bright purple. I can’t wait for it to bloom! Such a cute idea and I love the stencils you chose. It’s really coming together and looks so inviting. Keep it up. 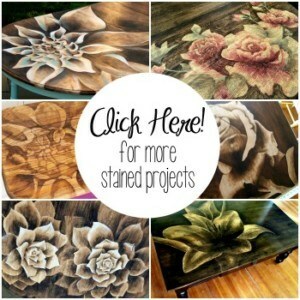 Huge fan of your blog and unique style! Love it!!! The shades of blue on the blocks is so pretty!! !